Isn’t it about time we plan for the vacation? While you’re slogging on your office desk or gazing through your books isn’t summer vacay on your mind? It is definitely ticking on my mind making me wander to places I’ve never been to before. While vacation is one reason to shop, I know the arrival of summer gives me another reason to shop. Living in a city with sea breeze and ocean waves, shopping for lightweight fabric becomes a necessity. This was on my mind just when the email notifications started buzzing. The kind of emails everyone likes to receive. It’s a pre summer sale kinda happiness. Want to know which sales were my favourite and my top picks from there? Then let’s begin sale hunting! This sale was definitely worth it, seeing the numbers go down 70% was definitely thrilling. 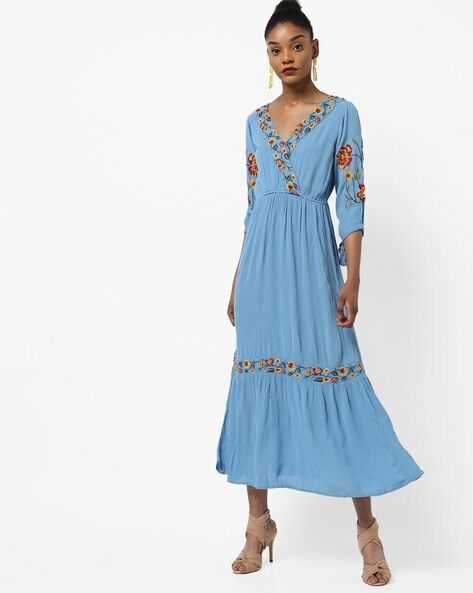 I love this maxi dress because of the floral embroidery and the freeness the maxis usually give. I could take this to the beach or to a brunch and be at ease for the breathability of it’s fabric. H&M lovers this is your chance to strike right, because H & M’s holi sale bags upto 50% off and free delivery on orders above 1,199. I’ve picked a pleated white blouse which is easily pairable with any trouser or skirt. The sheerness of this top is a great idea for summer. Another favourite is this red lace dress which you could take from dawn to dusk. The delicate feature of lace gives breathability and ease. I would take this out for a night out on my vacation. Myntra’s on going sale is no surprise to a shopaholic but their festive sales are usually ones to watch out for with added discounts on international brands and prices slashed to better than ever, there’s no question mark on it. I love this striped trouser from MANGO. I can totally imagine myself on a holiday cruising around the city in this one. The white and blue stripe is a true reminder of the summer season. Shopping for summer season needs no reason because you know you cannot survive a long humid day in jeans or embellished shimmery clothes. Shop easy and smart look for relaxed fit. Go for lightweight fabrics. Sale makes it easy to shop for more fluid pieces and make full use of this season to wear dresses and skirts. I’ve had a great time shopping around; hope you have an easy breezy time too. Got a question? Ask me below!